– Some Ebola control measures are causing local people to fear health-care workers. Nature – As the Ebola death toll spirals into the thousands in West Africa, the outbreak could have a spillover effect on the region’s deadliest disease. The outbreak has virtually shut down malaria control efforts in Liberia, Guinea and Sierra Leone, raising fears that cases of the mosquito-borne illness may start rising — if they haven’t already. So far, at least 3,000 people are estimated to have died of Ebola in Guinea, Sierra Leone and Liberia in the current outbreak, although World Health Organization (WHO) staff acknowledge that official figures vastly underestimate the total. By contrast, malaria killed more than 6,300 people in those countries in 2012, most of them young children. Overall, malaria deaths have fallen by about 30% in Africa since 2000 thanks to national programmes supported by international funding agencies such as the Global Fund to Fight AIDS, Tuberculosis and Malaria, the US Agency for International Development and the WHO’s Roll Back Malaria initiative. The schemes distribute free bed nets to protect sleeping children from mosquitoes, train health workers to find malaria cases and offer tests and treatment at no charge to patients. But the Ebola outbreak has brought those efforts to a standstill in the three affected countries. “Nobody is doing a thing,” says Thomas Teuscher, acting executive director of the Roll Back Malaria Partnership, based in Geneva, Switzerland. He says that malaria drugs are sitting in govern-ment warehouses, especially in Liberia and in Guinea, where medical supply trucks have been attacked by people angry with the government’s handling of the Ebola outbreak. Liberia had planned a national campaign to distribute bed nets this year, but Teuscher says that it may be difficult to launch that now. Routine health care has collapsed during the outbreak, because both patients and providers have shunned clinics for fear of infection. As a result, tens of thousands of people could die from treatable causes, says Estrella Lasry, a tropical-medicine specialist for medical charity Médecins Sans Frontières (also known as Doctors Without Borders) in New York. Those include complications of childbirth; trauma and other acute conditions requiring surgery; and causes such as diarrhoeal disease, respiratory viruses and especially malaria. With proper treatment malaria can usually be cured completely, but if left untreated it can develop into a severe form that is often fatal. As of August, the WHO had not seen a year-on-year increase in people with malarial symptoms reporting to clinics in Guinea, the only Ebola-affected country where such data are available. In fact, malaria deaths in Guinean clinics decreased for the first half of this year compared with 2013. But that is not necessarily good news, says Teuscher. It could mean that the illest people have been staying away from clinics, scared off by the Ebola outbreak, and their deaths have gone unnoted. Furthermore, the symptoms of malaria mimic Ebola, so many people who might have malaria are avoiding clinics for fear of learning the worst, says Alice Johnson, a nurse and clinical mentor for Last Mile Health, an organization in Boston, Massachusetts, that trains health workers in rural Liberia. Ebola’s impact on malaria programmes is likely to linger long after the outbreak ends. 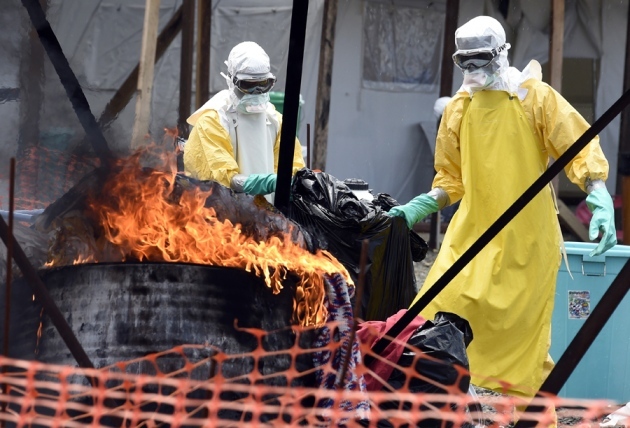 In Guinea, for instance, authorities bury Ebola victims with their bed nets to prevent the spread of infection; this has raised suspicion that the nets have some inherent connection to Ebola. And health workers are afraid to do blood tests to confirm malaria because Ebola is spread by blood and other bodily fluids. That could lead to people who do not have malaria being given antimalarial medication, which can contribute to the development of drug resistance in the parasite that causes the disease. It is important to get malaria control programmes back on track, says Teuscher, in part because they could help to fight Ebola. For instance, in Sierra Leone about 2,000 community health workers have been trained to go into villages to find and treat malaria. They could also be trained to detect Ebola and help infected people to get care, he says.